Cafe style shutters in this home in Richmond, Surrey create not only a stunning look for the lounge of this home, but also offer an extremely practical and flexible window covering solution. Cafe style shutters is the term used to describe any design of wood shutters which does not cover the entire height of a window. This design of wood shutters is most commonly used in lounge room or areas, often on the ground floor of a home, where passing traffic can look directly through the window. This particular house in Richmond, Surrey had wood shutters fitted on the lower portion of the window to stop people walking past the window, looking straight into the room. The customer felt exposed when sat watching TV in their Richmond home as people could see directly into the room.Net curtains were not an option for this customer and shutters offered a stylish solution to the privacy problem. The Richmond home had a nice aspect to the front garden and the Shutterly Fabulous customer did not want to loose the view through the upper portion of the lounge window and retain as much light coming into the room as possible. While many people think cafe style shutters refers to wood shutters which only come up to the halfway point on the window, the fact is that you can take the height of the wood shutters to any point on the window that you like. This window in Richmond lent itself to the wood shutters finishing approximately 2/3 of the way up due to the nature of the window framing. Finishing the wood shutters at this point gave the customer the privacy they were looking for while retaining the view and window detailing above the cafe style shutters. 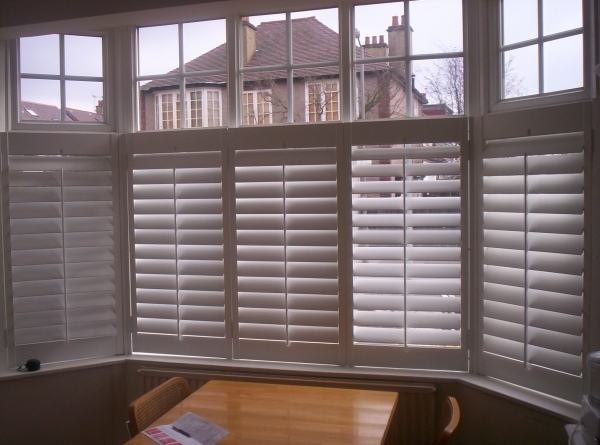 The cafe style shutters shown in this Richmond lounge are painted in shell and have 89mm slats. The shutters have the Open Sky concealed push rod system. The shutters have been designed to match the exact framing of the window and the solid upright sections of the cafe style shutters fall inline with the mullions on the window. Our Surrey customers can view our shutters display in the Guildford Furniture Village Store.